I have a thing for Central Asian music, which I wrote about in this piece, so I won’t recap here why it’s so appealing to me. This year, me and the wife were looking for a concert because we buy tickets every year to some event around the holiday season, instead of buying each other Christmas presents. Past experiences have been varied, from okay to horrible … from a fun Queen tribute band to awesome Kodo drummers to Shen Yun, which we unfortunately were not aware is a thinly (very thinly) veiled propaganda show and not an actual accurate representation of Chinese traditional culture. So, searching carefully around this year, I got lucky when I visited Small World Music’s site for the first time; I’m not entirely unfamiliar with this group’s promotions but had not attended any of its events. Well, didn’t my eyes just pop out of my head! 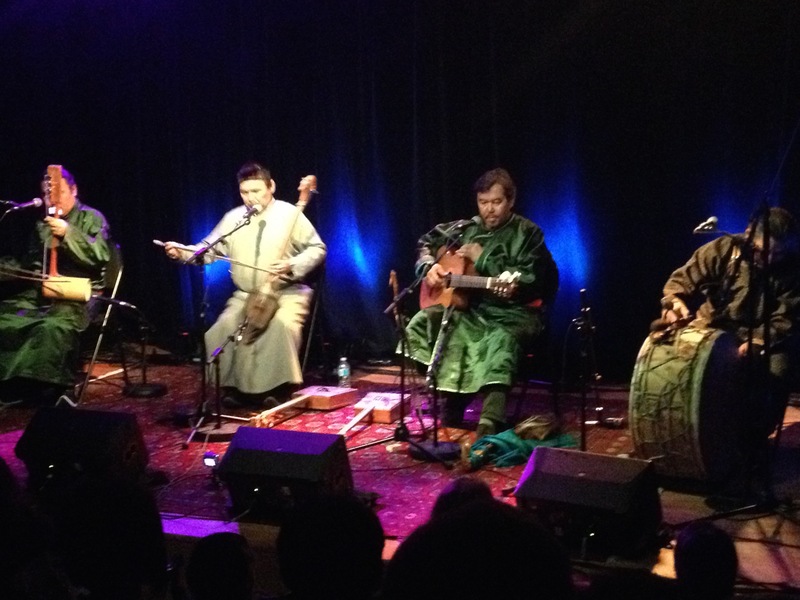 Huun-Huur-Tu, the kings of Tuvan music, or actually, maybe the kings of Central Asian music as a whole, were coming to play two shows in an intimate venue. Finally, a chance to hear and see khoomei, kargyraa and sygyt throat singing up close and personal, as well as the fabulous instruments the band plays. It was a bit like how a normal dude feels when he scores a Stones ticket or something; I was pretty damn excited. I listen to Mongol and Tuvan music all the time — a bit of a mainstay around here. Huun-Huur-Tu has an impressive discography that brings the listener’s imagination right into the Tuvan valleys and back in time as well; they are cultural ambassadors for their people, proudly bringing their traditions and their evocations of history and the beauty of nature alive through their music. I expected a great night, and I got one. The tiny theatre holds about 100 people in a comfortable environment and the crowd was your typical world music gathering of middle-aged hippies, old hippies, aging intellectuals and young hipsters. I’m not entirely sure which of those groups my wife and I belong in — more than one, though. Huun-Huur-Tu is made up of four musicians. Alexei Saryglar is the band’s percussionist, banging expertly on a bass shaman drum and using assorted small percussion to duplicate the horsey clop-clop so distinctive to Mongol music, as well as singing higher parts. The band’s spokesman, Sayan Bapa, who told us charmingly in his mellow, bassy voice about the meaning of the songs, plays a fretted instrument I believe to be a doshpuluur, and also nylon-string guitar. Kaigal-ool Khovalyg sings higher parts and throat singing parts and plays a couple of instruments, and Radik Tülüsh is the chuur (sort of like a recorder) and byzaanchy (vertical fiddle) player and handles various kinds of “clean” singing (in death metal terms…) and throat singing. Three of the band members play igil, the horsehair fiddle. In other words, they are all good at various things — master musicians. If you don’t know, khoomei (and other variants of throat singing) involves producing an overtone that is high and whistly and can be fashioned into melody while maintaining a gutteral drone beneath. The two-pronged sound is exotic and otherworldly to Western ears but is basically like having a band in your nasal cavities! Huun-Huur-Tu, impressively decked out in their traditional costumes, started the concert with all four of them singing this way, and amplified through the PA the effect was pretty mind-blowing. They then blazed through two hours of songs of their own composition and traditional tunes, sometimes energetic and tribal, sometimes melancholy and windswept. Bapa uses some really great open tunings on the guitar that would put any psychedelic acid folkie to shame. At one point the band took us on an aural trip to the taiga, mimicking nighttime bird calls as the lights dimmed to a dark blue and the song slowly got quieter and quieter. It was quite magical. Many of the songs we heard on this night are on their collaboration with electronic musician Carmen Rizzo, Eternal, one of the best world/electronic “fusion” albums I’ve heard … I hope the people who flocked to the lobby to purchase the album were aware that’s what they were getting! The effect of these songs, both the energetic ones and the melancholy ballads, is hypnotic, almost akin to ambient at times (it probably helps in that regard that we don’t understand the words); songs have verses and choruses but rather than a jolting transition where the chorus is clearly a different dynamic to the verse, as in Western music, there is a constant flow as the parts blend into each other, with strong droning elements. I think anyone with an interest in textural music will find this compelling. But more than that, you are witnessing a display of cultural pride in the most disarming fashion. While our interest in “world” music could be seen as a kind of patronizing cultural tourism, if you put aside all of your baggage as a fan of “exotic” sounds that make you feel different and more worldly than your fellow Westerners, there is still no doubting the intensity and power of these grooves and the incredible vocal and instrumental techniques on display. It helps remind those of us who have “discovered” it that our own Western music is just a tiny part of a vast world of different sounds, instruments, rhythms and themes. And the mystic connection between human, animal and nature expressed in Central Asian music is a great gift to the world. It’s a shame that an act like this of such great international importance played to a couple of hundred people over two days rather than a thousand at a great concert hall, as it deserves, but we who were there are very fortunate to have had such an intimate experience of greatness. And I thank Small World Music for its fine concerts, which I will attend far more of in future. Very cool. I also like that you and your wife treat each other to experiences for the holidays and not just stuff! Thanks! We have enough stuff. I’d like less stuff but more time to do things I want … that exchange is apparently not possible, though. Yes, that balance is hard to find, especially when what you want, in my case anyway, comes in 12″ inch vinyl or book form! Hahaha! We get in some quality live shows throughout the year as well, it’s a must. Hi! Do you have the program list of the songs they played by any chance? Hi Angie – no, there was no program handed out that I could see. I have a feeling most of the tunes were on this album: http://www.discogs.com/Huun-Huur-Tu-Ancestors-Call/release/3097087, and I recognized many of them from the electronic/fusion album, Eternal. But my lack of Tuvan language skills means I have no way of identifying them, alas.